On Saturday night in Ogden we saw one of the best performances of the young college basketball season. 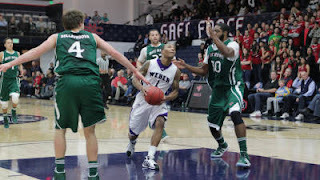 Damian Lillard of Weber State dropped 41 points, had 8 rebounds, and 4 assists in Weber State's 91-89 Double OT victory. That paragraph only barely does Lillard's performance justice. In the first overtime Lillard scored eight of WSU's nine points including another three-pointer that tied the game at 71. Then with the Wildcats down four with 2:00 to play, Lillard scored five quick points. He first hit a floater in the lane, then stole the ensuing inbounds pass and scored, and was fouled on play and hit a free throw to give the Wildcats a one-point lead. In double OT, he was even better. He scored 9 of Weber State's 13 points, including the game-winner. With about 10 seconds to play, the Wildcats trailed by 3. He drove to the lane, scored a basket and was fouled, completing the three-point play to give Weber State the lead and ultimately the win. "I didn't really feel like I couldn't let the team lose," Lillard said. "I felt like we couldn't let ourselves lose on our home floor. I think that's what it was more about than me not letting them lose. I'm the leader of the team. I felt like I should be the first one to step up and say 'I'll do it,' and tonight I did." This follows Lillard's 36 point performance against St. Mary's, and has upped his already nation-leading scoring average to 28.2 PPG. He is the best player in the conference and he showed it on Saturday, with a performance that Weber State fans are going to remember for a very long time. Amazing game by DLill. Best individual performance by a Wildcat I've seen since the Show went off for 40 in 2000.